KFC has produced edible nail polish for customers in Hong Kong. KFC thinks you should take its "Finger Lickin' Good" slogan literally. The nail polish comes in two flavors and colors: Original (kind of a beige) and Hot & Spicy (red). To use it, customers can paint the polish on their nails, let it dry, "and then lick -- again and again and again." KFC says the nail polish is "sourced from natural ingredients," perhaps in an effort to make customers feel safer about licking nail polish. "The recipe for our edible nail polish is unique and was specifically designed to hold the flavor, but to also dry with a glossy coat similar to normal nail polish," said John Koay, creative director for Ogilvy & Mather. "This campaign is designed to be intriguing and fun to increase excitement around the KFC brand in Hong Kong." 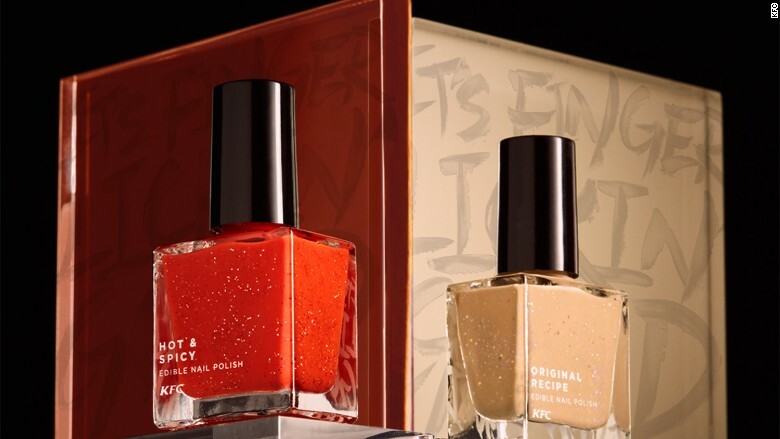 The KFC nail polish is packaged in a "designer bottle and box" (not a bucket). The chicken chain has promoted the nail polish on Facebook and social media over the past two weeks, even releasing a music video on YouTube. Edible nail polish isn't a new thing, though most of them are vegetable-based and marketed towards children.